Santa Monica Pier and El Pueblo de Los Angeles will appeal to history buffs. Relax by the water at Venice Beach and Boardwalk and Carbon Beach. Venture out of the city with trips to The Queen Mary (in Long Beach) and Santa Monica (Third Street Promenade, Montana Avenue, & more). Pack the 7th (Sun) with family-friendly diversions at Universal Studios Hollywood. 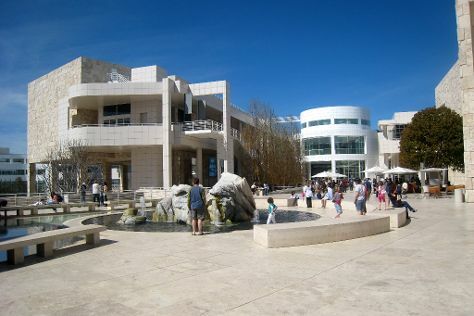 There's still lots to do: examine the collection at The Getty Center, look for gifts at Amoeba Music, take in the exciting artwork at Annenberg Space for Photography, and get a new perspective on nature at La Brea Tar Pits and Museum. To find ratings, more things to do, other places to visit, and tourist information, go to the Los Angeles day trip planner . Boston to Los Angeles is an approximately 7.5-hour flight. You can also do a combination of bus and flight; or drive. The time zone changes from Eastern Standard Time to Pacific Standard Time, which is usually a -3 hour difference. July in Los Angeles sees daily highs of 83°F and lows of 66°F at night. Finish up your sightseeing early on the 16th (Tue) so you can travel to Avalon. Avalon is the only incorporated city on Santa Catalina Island of the California Channel Islands, and the southernmost city in Los Angeles County. Shop till you drop at Afishinados Gallery and Ruth Mayer Gallery. Take a break from the city and head to Catalina Island Conservancy and Nature Center at Avalon Canyon. The adventure continues: see majestic marine mammals with a dolphin and whale watching tour, admire the masterpieces at Catalina Island Museum, get interesting insight from Tours, and appreciate the history behind Wrigley Memorial & Botanic Garden. For ratings, traveler tips, where to stay, and other tourist information, refer to the Avalon trip planner . Traveling by combination of bus and ferry from Los Angeles to Avalon takes 4 hours. Alternatively, you can do a combination of tram and ferry. Plan for slightly colder temperatures traveling from Los Angeles in July, with highs in Avalon at 77°F and lows at 61°F. Finish your sightseeing early on the 23rd (Tue) to allow enough time to travel to Ventura. Ventura, officially the City of San Buenaventura, is the county seat of Ventura County, California, United States. Museum-lovers will get to explore Ronald Reagan Presidential Library and Museum and Dudley House Historical Museum. Get outdoors at Santa Monica Mountains and Zuma Beach. Change things up with these side-trips from Ventura: Malibu (Nicholas Canyon Beach, El Pescador State Beach, & more), Fillmore Fish Hatchery (in Fillmore) and Strathearn Historical Park & Museum (in Simi Valley). The adventure continues: stop by SpiceTopia, make a trip to Serra Cross Park, take in the spiritual surroundings of Mission San Buenaventura, and grab your bike and head to Ventura to Ojai Paved Bike Path. For maps, reviews, more things to do, and other tourist information, you can read our Ventura online trip itinerary builder . Use the Route module to find suitable travel options from Avalon to Ventura. In July, daytime highs in Ventura are 73°F, while nighttime lows are 62°F. Finish your sightseeing early on the 30th (Tue) to allow enough time to travel back home.